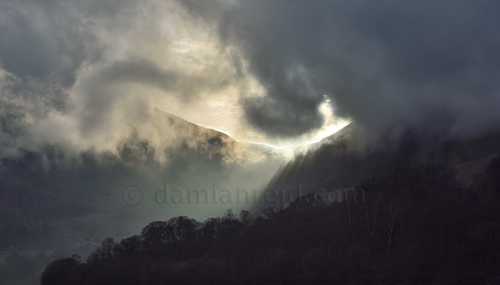 "A fleeting glimpse of sunlight through dramatic rain clouds forming over Glencoyne to Sticks Pass, with The Raise lit up in the distance. The shot was taken in March 2016 from Aira point near the new Aira Force pier. Beautiful shafts of light could be seen among the trees on Glecoyne Brow. Sheffield Pike is on the left of the scene. " The edition size is restricted to 75. Each photographic print within the edition is signed, numbered and includes a certificate of authenticity. All are created using archival quality pigment inks and heavyweight archival paper for longevity. Open Edition photographic prints are smaller and the number produced is unrestricted. They are signed and created using the same archival quality pigment inks and heavyweight archival paper for longevity as limited editions. Please note that, after March 2016, it will no longer be possible to purchase framed and mounted photographic prints by mail order. Images will still be available as print only and offered in the same limited and open editions as before. Please contact us for further details. Framed and mounted versions of images can of course be obtained directly from galleries and other venues exhibiting Damian Reid's work. Additionally, many photographs will continue to be available for purchase as digital image files for use in publications, websites or for broadcast. Please email to discuss your requirements. The images displayed on this website are just a sample. There are numerous other photographs depicting places and subjects which may be of interest to you that are not shown. Enquires are always welcome. Please view our Terms & Conditions page for more information about purchasing prints and digital image stock.